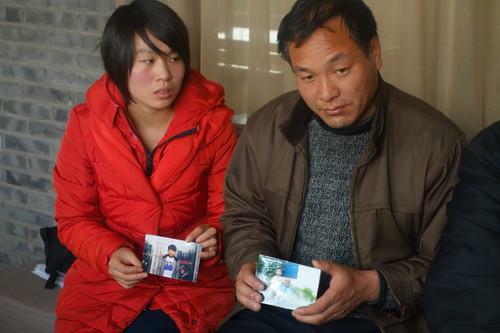 The father and cousin of deceased 15-year-old Pegatron worker Shi Zhaokun hold up his picture. An iPhone factory in China that's been the site of several worker deaths in recent months has been under-reporting the long hours employees endure, according to an investigator from a labor protection group. The Shanghai factory run by contract manufacturer Pegatron is one of Apple's suppliers for its iPhone handset. But to meet production quotas, workers at the facility generally work 72 hours per week, said Huang Bin, an investigator with New York-based China Labor Watch. The long hours counter Apple's claim that it's been trying to limit overtime at its suppliers to 60 hours per week. In June, during the one month Huang worked at the Pegatron factory, Apple said on average 99 percent of its suppliers complied with the 60-hour work week limit. "There's no way they can achieve the working hour limit. The factory must reach a certain quota in the production," he said. "It's very hard for a worker to ask for a day off." During his time at the factory, Huang said Pegatron's management regularly handed out attendance sheets for each employee to sign off on. The attendance sheets, however, under-reported the number of hours employees logged in the given week. "Apple is demanding the factory control the working hours," he said. "But the factory can't reach the goals." Apple did not respond to a request for comment. But the company routinely audits its suppliers factories to ensure they are following labor regulations. It has also been working to improve conditions at the facilities and in 2012 joined the Fair Labor Association. Last week, the manufacturer confirmed several workers at the factory had died of different illnesses in recent months. One of the deceased was an underage worker, a 15-year-old named Shi Zhaokun, who died of severe pneumonia. Pegatron said the deaths were unrelated, and were not the result of working or living conditions at the factory. Shi's family, however, believes the long working hours at the factory played a role in his death. The last time his family spoke with Shi, he had a slight cold, but was feeling better and had taken medicine, said Yang Xiaosa, a cousin, on Monday. A week later, Shi was found looking severely ill at the factory's cafeteria, and taken to a hospital, where he then died, family members said. "We wanted him to take a day off, but he said it would not be easy to," Yang said. Shi had worked 280 hours in the month before his death, according to China Labor Watch. The family is demanding the factory explain what led him to contract his illness. Pegatron last week said it remains in contact with the families of the deceased workers and is providing assistance. The Shanghai factory employed 70,000 to 80,000 workers at the end of September, according to the company.